Learn about the latest fashion and performance with Dress Men's Shoes. We research new products and companies to keep you up to date on what is happening in the world of shoes! 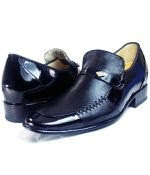 JGL dress shoes are ideal for extravagant men who want to make an impression. I don’t know if it is because of the lighting effects or these shoes are navy, but this detail and the stitch makes them more special. The combination of normal and varnished leather is perfect for a dress outfit so, don’t worry if you think that it’s a little bit too much.